TUESDAY, 1 MARCH – A Conferment of Rank of Auxiliary Police Officers for 35 staff of Security Division, Universiti Malaysia Sabah (UMS) who had completed their Basic Police Training last year, was held today. UMS Registrar, No’man Datuk Hj. Ahmad when speaking at the opening ceremony of the event said, the power bestowed to Auxiliary Police that was accorded to the staff of Security Department UMS would improve the overall quality of service, and enhance their self-esteem and adhering to the rules and regulations of the Royal Malaysian Police. 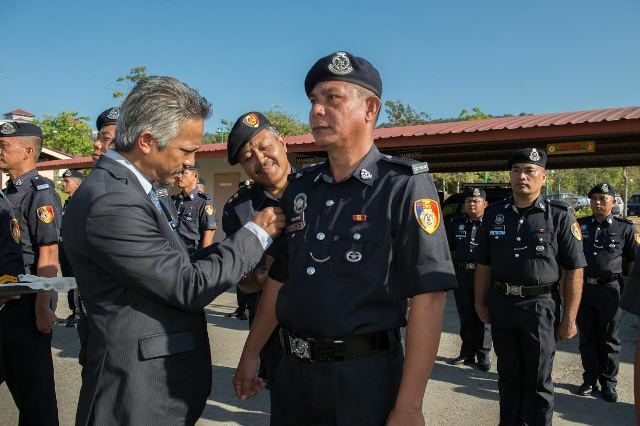 “With the establishment of UMS Auxiliary Police, it is hoped that it would raise the image of the university that often receive visits from various agencies, either from within the country or abroad. “The presence of these official would also increase the sense of security, especially to the campus community and the general public who often deal with UMS,” he added. At the ceremony, No’man also officiated the Handheld System that would facilitate and assist in the enforcement of traffic regulations within the campus, introduced today.